First Instagram, then Facebook. And now WhatsApp. 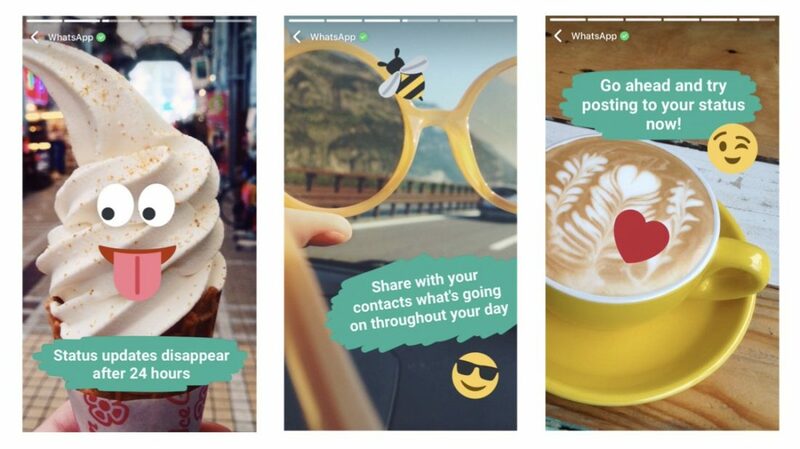 It seems that everyone wants a piece of the Snapchat pie — in its latest update, WhatsApp’s Status feature has been modified to create messages using photos, videos and GIF images, bearing a striking resemblance to Snapchat’s Stories feature. Users of the instant messaging app can update their status throughout the day (à la Snapchat…), which will be visible to contacts for 24 hours before disappearing into a black abyss. How to jazz up your status? Head to the Status tab. Then simply tap on the circle with plus symbol – the camera will open, and you can get snap happy. After perfecting that masterpiece, make it live for all your friends to see! In an attempt to eclipse what literally everyone is thinking, WhatsApp’s founder and boss Jam Koum insists that the company had been working to improve the status feature ever since it was first introduced in 2009, stating that “the app was created as a way of posting these statuses – so that you could let all your friends and contacts know what you’re up to”. It’s okay Jam, we’ll look the other way…. Remember talk of Instagram’s new update, featuring a magical multiple image reel? Well, it’s finally here. The reel lets you combine up to ten photos and videos into a SINGLE post, meaning you no longer have to choose one photo of the caramelized banana french toast you ate at that pop-up brunch place in Shoreditch that you spent 90 minutes queuing for. Or that epic party you nearly missed out on because you were binge-watching a Netflix show in your onesie. Though users can only provide one caption for the entire slideshow, you know what they say — a picture paints a thousand words. And now there’s ten…. Launched just in time for London Fashion Week, British Vogue is the latest brand to create its very own bot for Facebook Messenger. Designed to send personalised news direct to a reader’s inbox, the bot can be found on the British Vogue Facebook page or direct via Facebook Messenger. Users select their own personal preferences about the articles and highlights they would like to receive, and how often they’d like to receive them. And, for the fashion-obsessed, the bot can instantly send updates or stories from a specific designer, meaning you’ll never have to worry about staying on top of the latest runway news again. Let’s just hope the bot’s backend system doesn’t experience more issues than Vogue…. Twitter is taking action to “humanise” its business partners’ customer service-based Direct Messages through a spanking new personalised customer service interaction. In its new feature, businesses can make private conversations with customers more personal by showing the real face, name and title of the care agent who is engaging in conversation. The social networking service announced that new versions of its Direct Message are currently in private beta, but are being slowly rolled out to more and more business accounts. So, if you’re reading this and you’re a business owner, expect to drive more personalised experiences and customer satisfaction in the next couple of weeks! 24 year old social media enthusiast. Always wearing lipstick. Always hungry.